Measurement Library. Mobilyzer is designed to be easy to use and integrate into existing apps, while providing incentives for doing so. It is deployed to apps as a library with a well-defined API for issuing/controlling measurements and gathering results locally. This facilitates development of new apps that use network measurements. For example, an app that includes our library can issue a measurement and retrieve results with under 10 lines of code. Existing apps can incorporate our library to take advantage of our validated measurement tools and server-side infrastructure. Local measurement scheduler. Mobilyzer achieves the goal of measurement isolation via the local measurement scheduler. The scheduler listens for measurement requests and ensures that any submitted measurements are conducted in the intended environment (e.g., radio state, state of other apps using the network, and contextual information such as location, signal strength and carrier). 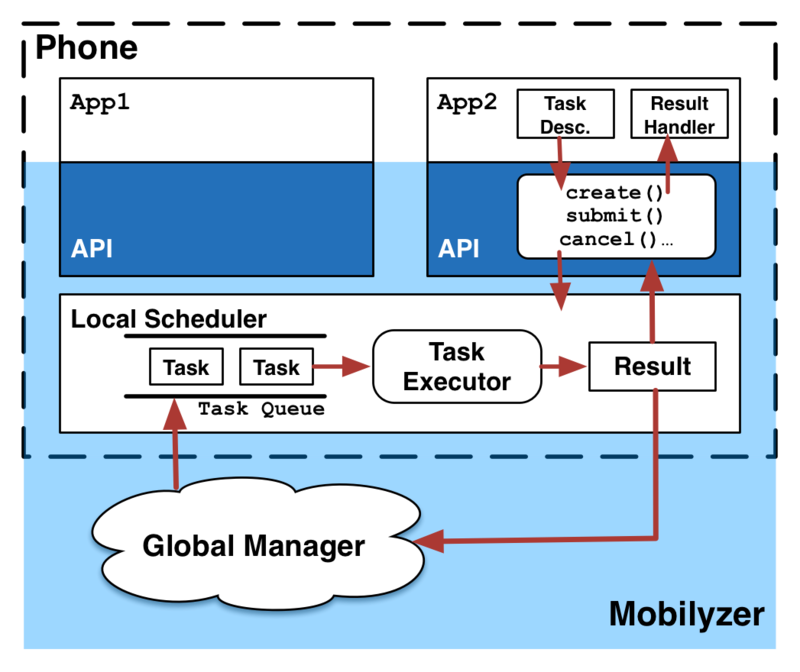 Regardless of how many apps on a device use it, Mobilyzer ensures that there is exactly one scheduler running. If apps with multiple versions of the scheduler are present, the latest version is guaranteed to be used. The scheduler enforces user-specified limits on resource (data/power) consumption. Global manager. The Mobilyzer global manager provides coordination for the following services: dynamic measurement deployment, resource cap enforcement, and data collection. This support is quite unique to our platform, as global centralized coordination improves the design of mobile experiments despite limited resources. Experimenters use the global manager to deploy measurement experiments to devices. For example, an experiment may contain a number of network measurements that should be conditionally deployed and executed according to device properties. The global manager deploys these measurements to devices based on device information reported periodically, and ensures that measurements are not deployed to devices that have exceeded user-specified resource caps. The manager maintains a datastore of anonymized data collected from all devices and makes this available for interactive measurement experiments and for offline analysis. The data collection and scheduling support at the global manager enable dynamically triggered measurements based on observed network behavior, achieving a feedback loop of measurement, analysis, and updated measurements.